Could you veganize pork lumpia without tofu, mushroom, or gluten? Astig Vegan's honorary guest. “Mommy Henya” not only thinks so, she knows so. And she will show us how. In Philippine cuisine, there are two kinds of fried lumpia – Shanghai and Vegetable Lumpia. The Shanghai has ground pork, wrapped bite-size, deep-fried, and dipped in banana ketchup. The second has vegetables like bean sprouts, cabbage, and tofu, wrapped full size, deep-fried, and enjoyed with vinegar. My aunt, the beloved expert cook of the Enriquez clan, came up with the best of both worlds – Vegetable Shanghai. No she did not create a vegan version for me. In fact, she did not create it for any vegan. Mommy Henya’s version is for her biggest meat eaters – her son and grandson. Mommy Henya told me her son and grandson love eating Lumpiang Shanghai and all things meaty. She said they HATE eating vegetables so much they would even pick out tiny minced carrots from a spaghetti. To make her family eat vegetables, she thought of disguising Lumpiang Shanghai using sweet vegetables like kabocha squash, sweet potatoes, jicama, potatoes, and carrots. She wrapped them as she would wrap Shanghai, deep-fried, and served with banana ketchup. The result?Her kids and grandkids couldn’t even tell there was no pork and all they were eating were vegetables! Mommy Henya has figured out which vegetables could work for Lumpiang Shanghai. These vegetables are NOT the same ones in a Vegetable Lumpia hence the distinction. It’s not vegetable Lumpia but vegetable Lumpiang Shanghai. Get it? If not, it’s basically a simple and delicious dish everyone could enjoy, even for picky eaters. 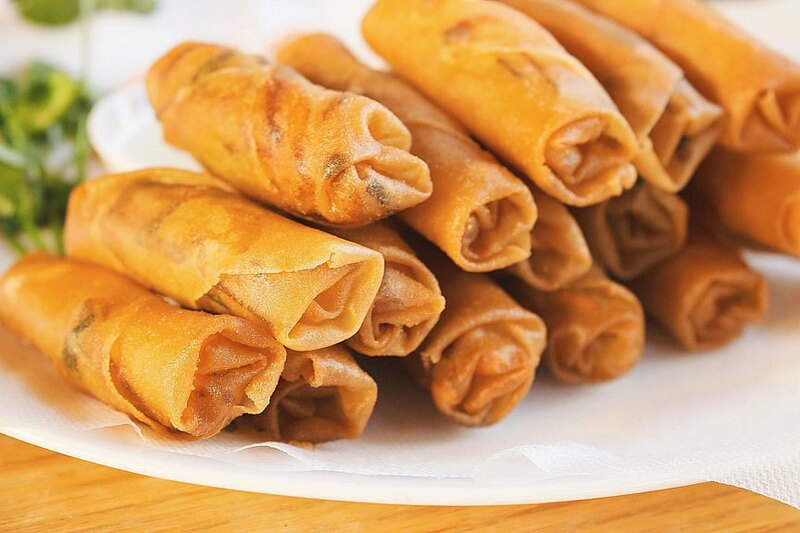 Not to be mistaken for Vegetable Lumpia nor Lumpiang Shanghai, these vegan Filipino fried spring rolls are great for snack, appetizer, or party food. They're also great for picky kids and hungry grown ups, even the biggest meat eaters! 1. In a bowl, combine all vegetables, salt, sugar, and corn starch. Mix well. 2. Using a pair of scissors, cut the the Lumpia wrapper diagonally in half. You should have two sets of triangles. To keep the wrapper from drying, place a clean damp towel on top. 3. Peel off one sheet of the wrapper and place on a plate, with base of the triangle on bottom and tip of the triangle pointing to top of the plate. 4. Add about one teaspoon of the vegetable filling on the lower center of the wrapper, leaving about ¼ inch of empty space below the filling. 5. Fold the left side of the wrapper toward the center. Fold the right side toward the center. Fold up the bottom part then roll up until it reaches the top tip. 6. Seal the top with a little bit of water. Finish rolling. Repeat steps until all lumpia are rolled. 7. Heat a small size pot in high heat for about 3 minutes. 8. Pour cooking oil and heat for another 5 minutes. 9. Test if the oil is hot enough by dropping a piece of lumpia wrapper. If it bubbles quickly, it's ready. 10. Gently drop 5-8 pieces to deep fry. Lower down the heat to medium heat. 11. Fry until all sides of the wrapper are golden brown. Repeat step to fry rest of the lumpia. If you're feeding only few people, fry only the amount you desire and store the rest of the wrapped lumpia in the freezer for later use. 12. Place fried lumpia in colander or on paper towel-lined plate to absorb excess oil. 13. Serve hot with sweet sauce-like ketchup. Not all lumpia wrappers are vegan. Some have eggs. Double check by reading the ingredients list. You may find lumpia wrappers at Asian grocery stores. To prevent the lumpia wrapper from drying, place a clean, damp paper towel or cloth on top during the rolling process. Make sure you add the corn starch directly to the vegetables. Do NOT mix the starch with water before adding to the mix. Doing so will tear up the wrapper. If you're feeding only few people, cut back the ingredients serving in half. Or wrap all 50 pieces and store them in the freezer. The next time you want an instant meal, just grab the frozen lumpia and deep fry. Here’s a video recipe featuring Mommy Henya herself! Many thanks to Mommy Henya for sharing her recipe to the world. Mommy Henya is my dad’s eldest sibling (out of 10!). She loves to cook not only for her husband, kids, and grand kids, but also for the entire extended family (you could just imagine how big the family parties could get). Mommy Henya’s vegetable Lumpiang Shanghai goes to show that even seasoned Filipino cooks can come up with something vegan and even the pickiest kids and meat eaters like her kids and grandkids, can enjoy something that’s full if not all vegetables.